Ever wonder how to recreate a look from past decades like the 1920s, 30s and on up until the 60s? Hair and makeup artist, LAUREN RENNELLS has come out with yet another book to help you create the looks at home. Her third book, Vintage Makeup: Techniques for Applying the Vintage Look and goes over how makeup was worn in decades past. Vintage & Pinup Styles R Wearable Now More than Ever! 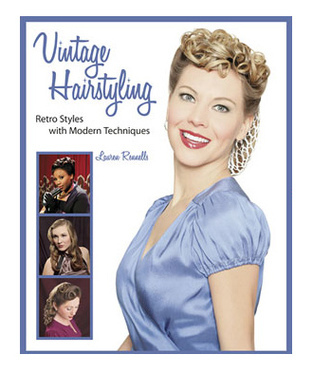 Just out is Lauren Rennells’ Vintage Hairstyling: Retro Styles with Step-by-Step Techniques 2nd Edition ($32.95 @ vintagehairstyling.com). Choose from more popular styles from the 30s, 40s, 50s and 60s and step-by-step instructions on how to achieve each style. And this one also goes over hair products that are good to use, tools, hair accessories, and even how to do your makeup and how to do your nails from each decade, which I don’t think were in the last book. Only after I featured the first book on this site and really got into trying more of the styles did I come to the conclusion that one tweak would make this book perfect. Instead of binding the pages, they should be wire bound, like a notebook. That way I can open it comfortably to a specific style and follow the directions and not have to fight to keep it open each time. I actually took apart the 1st edition and secured the pages with a big binder clip. Must easier to use! And Lauren, I still want you to one day do my hair one day as my arms are killin’ me! We don't usually write about books, actually, we never feature books on Cybelesays but I picked this one up the other day and I'm really into it. I've been into Pin-Up pre-Dita Von Teese and would style my hair in retro fashion here and there and thought I was doing a pretty good job. But then I came across this book, Vintage Hairstyling: Retro Styles With Modern Techniques by Lauren Rennells ($29.95 @ vintagehairstyling.com) and realized I could do a better job! This book spells out step-by-step how to make the proper pin curl, how to get the Gwen Stefani pompadour and even gives a clear breakdown of the tools used for creating the styles. There are 25 different styles illustrated in the 164 pages. If actually creating the styles is not your thing, this book really gives the reader an appreciation for how our mothers and grandmothers did their hair and makeup back in the early to mid-20th century. And Ms. Lauren, if you ever come to LA, I am going to beg you to do my hair!